When you look back at the history of science, you'll notice that it is heavily punctuated by radical ideas to solve complex problems. Some of these radical ideas have lead to changes that shaped and changed the world, others not so much. For example, American doctor Jonas Salk saved the lives of millions and practically eradicated the disease polio in the 1950s by injecting people (including himself and his own family) with ‘inactive’ versions of the polio virus; a hefty risk that paid off. Other medical cures haven’t proved quite so successful. For example, there is the sad case of Alan Turing, a brilliant British scientist without whom you would not have the computer you are reading this on now. Around the same time Salk was developing his polio vaccine Turing was convicted of being a homosexual (a custodial offence in the UK at the time) and rather than face prison he was forced to undergo estrogen injections to ‘cure’ his homosexual urges. The side effects were, of course, horrific and not long after he committed suicide by taking a bite from an apple laced with deadly cyanide (some people speculate the logo for Apple computers pays homage to Turing). Obviously those are two very extreme examples, but they set the scene for the topic of this post, which is radical thinking in science, especially in relation to endometriosis. Endometriosis is complicated, no matter what your views on the origin, treatment or mechanism of the disease; we can all agree it is complicated. In order to solve a complex problem, no matter what it is, people have come up with many different possible solutions and endometriosis is a shining example of that. There are so very many different types of treatment for the disease, from established treatments like the multitude of hormonal therapies and surgeries, through alternative medicine all the way to cutting edge technology like gene therapy. But the field is always progressing, as scientists we are always researching and doing experiments to try and solve complex problems and sometimes the ideas that are borne of these experiments can seem a little different or unusual at first. Take, for example, this piece of research by a group from Turkey. This group induced endometriosis in rats and then divided them into two groups. One group of rats were left to get on with their business without any interventions (a control group), whilst the other group was placed in hyperbaric oxygen therapy (HBO) for two hours a day over 6 weeks. 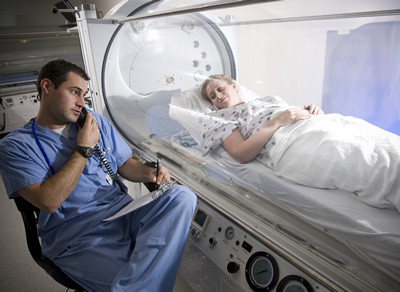 So what is hyperbaric oxygen therapy? Basically it involves the subject being placed in a chamber which contains pure oxygen which they breathe for a period of time. This isn’t a new treatment either; it’s been used for a long time to treat all sorts of conditions, from sports injuries to carbon monoxide poisoning and even alleviate the side effects of radiotherapy, but never as a possible treatment for endometriosis (for more on HBO follow this link). Below is a picture of a HBO system used for humans. Anyway, back to our original study. The results of this study showed that endometriotic implants of rats receiving HBO had decreased in size compared to the implants from the control group. There was also a marked decrease in markers of inflammation in the HBO rats. Essentially endometriosis in the HBO rats had gone into remission. So why might his be the case and where do we go from here? Well, HBO is used for the purposes I mentioned above because it encourages wound healing and also helps boost the immune system, so it could be that the HBO therapy is helping the body destroy the endometriotic implants. Despite this being an animal based study (which means it may not work the same in humans) this is still an encouraging result as HBO therapy has no serious side effects and is overall very safe. Because of this, in the future it would be easy to test HBO therapy on human subjects with endometriosis to see if it could help recovery from surgery or reduce symptoms. Whilst I’m not anticipating hyperbaric oxygen therapy will be a cure for endometriosis, the type of thinking that the authors of this study were doing will eventually lead to a cure. By that I mean in science it is important to step out of one’s comfort zone occasionally, take risks, think of the radical ideas no-one has thought of before but be prepared to be proved wrong and always be held accountable. It is only by embracing what is new and being fearless in our approach that means we will, one day, find a cure for endometriosis.